Portable chargers from Anker and TravelCard are your best bet if you want to make sure that your mobile devices won't run dry when an outlet is nowhere to be found. They are well-made, reliable and draw the lion's share of positive reviews. The Anker PowerCore Speed 10000 QC is the ideal charger to keep in your bag for emergencies. It can bring a dead phone up to full power in under two hours, and it can repeat the trick three to four times. It's equipped with smart charging, so it automatically tailors the current to your device's needs, and QuickCharge 3.0 for maximum speed. It's backed by an 18-month warranty and Anker's solid customer service. The TravelCard charger is the ultimate in portability. This truly wallet-sized card is just slightly bigger than a stack of three credit cards. Available in Apple and Android versions, it comes with either a built-in micro-USB or Lightning cable, plus a built-in USB cable (for charging) – so there's nothing else to carry. The TravelCard can charge a standard smartphone to as much as 50 percent, and it's one of the few mini chargers that supports pass-through charging. Road warriors who need to charge two devices at once (or who need to charge one device over and over again) need the Anker PowerCore 20100. About the size of a large eyeglass case, it has two USB ports and 20,100 mAh capacity -- enough to charge a typical smartphone five to six times. It also offers smart charging, LED power indicators, and a solid 18-month warranty. Once again, Anker's customer service draws plenty of user kudos. Portable devices like smartphones and tablets are equipped with built-in rechargeable batteries that always seem to need recharging at the worst possible moment. When that happens, the search for power can become desperate. Visit any airport terminal or similar venue and you are sure to see masses of power-starved devices -- and their owners -- huddled around every available electrical outlet. Portable chargers - also called power banks or USB battery packs – eliminate the need to find an outlet while you're on the go. These devices can get a dead smartphone up and running in a jiffy -- and up to half-charged or better in under an hour. When the charger itself runs out of juice, you can recharge it from a powered USB port on a computer or laptop – or, for faster results, plug it directly into a wall outlet. Most portable chargers don't come with an AC power supply, but you can often use the one that came with your mobile device. Some chargers can even continue to provide power to your devices while they're being recharged, a feature called pass-through charging. This can be a real convenience when you're pressed for time and outlets. Portable chargers are lighter, smaller and more ruggedly built than ever before. Mini power banks the size of a lipstick tube or a stack of three credit cards pack enough capacity to fully charge a drained smartphone once or twice over. On the other end of the spectrum are powerful chargers rated at 20,000 mAh or more, which are about as big as a large paperback, weigh around a pound, and can power up to four devices at once. These powerful portable chargers typically cost from $30 to $50, but basic models are available for $20 or less. A final feature that sets the best portable chargers apart is their lifespan – the number of times they can be recharged and discharged before their own internal batteries give out. The best models include fail-safes to protect them against overcharging, so they won't damage or overheat your devices. Some also include protection against surges, short-circuits, and high temperatures. Finally, a good charger should be backed by a strong warranty, so you can get a replacement if it conks out too soon after purchase. The best portable chargers pack plenty of power in a small package. They can power up your devices quickly and reliably, and they're easy to use. Many of them offer useful extras like indicator lights and pass-through charging, which will let you recharge the power bank even as it's recharging your mobile device(s). To get a handle on performance and features, we first looked to professional comparison tests from sites like Wirecutter, Tech Advisor, GottaBeMobile, and Gadget Viper. User reviews from sites such as Amazon and Best Buy helped us gauge long-term durability and the kind of customer service you could expect from the manufacturer or distributor. We factored in all these results to select our Best Reviewed portable chargers. If you're looking for a portable charger that tucks into a pocket and can provide multiple recharges for your devices while you're on the go, our sources say the Anker PowerCore Speed 10000 QC (Est. $40) is the one to buy. Marie Black of Tech Advisor describes this as "an awesome little power bank: tiny in size, but with heaps of power and insanely fast charging speeds." It measures 3.9 by 2.5 by 0.9 inches – just a bit bigger than a deck of cards – and it weighs only 7 ounces. Its rated power is 10,000 mAh, but Black says it's roughly 60 to 70 percent efficient, so you'll only get 6,000 to 7,000 mAh out of it in practice. However, that's still enough to provide four recharges for an iPhone or a low-end Android phone. For "flagship Android" devices, with around 3,000 mAh of battery capacity, the Anker is good for two full charges. The PowerCore Speed is packed with other useful features, as well. It comes on automatically when you plug in your device, and its smart charging technology automatically senses the ideal level of current for your device and adjusts accordingly. It also supports QuickCharge 3.0, allowing it to charge more powerful devices at top speed. Built-in safety features protect the charger – and any attached devices – from power surges, short circuits, and overheating. There are four LED indicators on top of the device, which you can light up with the push of a button to see how much power you have left. The charger has one micro-USB input and one USB output, and it comes with a USB-to-micro-USB cable. Anker backs the charger with an 18-month warranty. We found over 800 reviews for the Anker PowerCore Speed 10000 QC at Amazon.com, with an excellent overall rating of 4.7 stars out of 5. Owners love its compact size and say that it works fast, charging their devices from dead to full in under two hours. Most say they can get three full charges out of it for a smartphone and up to two for a tablet. However, the device itself is slow to recharge, requiring about 5.5 hours to restore itself to full power. There are a few complaints from owners whose devices were defective or broke down, but these are countered by praise for Anker's helpful customer service (see more about that below). If you don't need quite as much reserve power as the Anker charger provides, you can save a few dollars by choosing the Jackery Bolt 6000 (Est. $30). In an extensive comparison test at Wirecutter, this earns the title of the best USB charger for everyday use. It measures roughly 3.7 by 3.1 by 0.8 inches – about the size of a bar of soap – and weighs a full ounce less than the PowerCore Speed. It also has a nice feature the Anker charger lacks: two built-in cables, both micro-USB and Lightning. This means you can't possibly be caught short without the appropriate charging cable; as long as you have your Jackery Bolt, you can charge any iOS or Android device – or both at the same time. Alternatively, you can hook up a standard USB cable to the Bolt's charging slot and output a full 2.7 A all at once. As an added perk, the Bolt includes a small built-in flashlight for emergencies. In Wirecutter's tests, the Jackery Bolt put out an average of 3990 mAh (20.06 Wh) when charging at 1-amp speeds - enough to charge a medium-sized smartphone twice. Users at Amazon say it can fully recharge their phones in one to two hours. They also appreciate its compact size, integrated cables, and built-in LED flashlight. They have good things to say about Jackery's customer service, as well. As with the Anker PowerCore Speed 10000 QC, we found several reviews from pleased customers who say Jackery replaced their defective devices promptly. In Wirecutter's tests, the 1,500-mAh TravelCard (Est. $29) takes the prize for the best mini charger. This amazingly small charger is just a hair longer and wider than a credit card – 3.6 by 2.4 inches – and about three times as thick, meaning it's actually small enough to tuck inside many wallets. More amazing still, this tiny charger comes with two built-in cables. There's a standard USB-A plug to recharge the TravelCard itself, and a second connector, either micro-USB or Lightning, to charge your devices. Mark Smirinotis of Wirecutter says the entire Wirecutter team loves this feature, because it means there's nothing extra to carry around with you. As long as you have the TravelCard, you've got backup power on tap. Unfortunately, you don't get very much of it. In Wirecutter's tests, the TravelCard provided only 1,048 mAh, or 3.8 Wh, of power on average. That's only enough to provide 30 to 50 percent of a full charge for most smartphones. Even for a mini charger, that's pretty limited. Also, like most other mini chargers, the TravelCard can't supply power very fast; 1 A is about its maximum for both discharging and recharging. On the plus side, the TravelCard is one of the few mini chargers that supports pass-through charging, so you can make the most of your time at the outlet by charging it up even as it's charging your phone. Another perk of the TravelCard is its solid build. Smirinotis notes that several Wirecutter staffers have been relying on this charger since it came out in 2014, with no complaints. 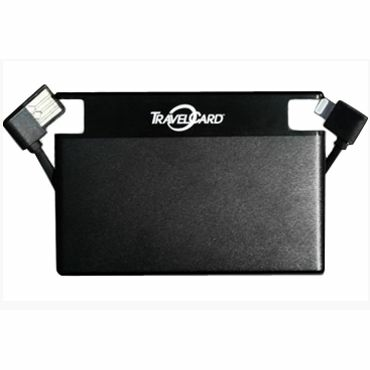 Unfortunately, while every expert that's tested this charger has come away with largely positive impressions, we couldn't find any user reviews to prove its reliability; TravelCard is available only directly from the manufacturer, which doesn't provide any user feedback on its site. It only comes with a 6-month guarantee, which isn't a terribly encouraging sign. Nonetheless, if portability is your top concern, the TravelCard is hard to beat. If the TravelCard just doesn't provide enough juice for your needs, the slightly larger Anker PowerCore+ Mini (Est. $15) is a good choice. This lipstick-sized charger sports a rugged anodized aluminum case and packs a full 3,350 mAh of power. The review landscape is the exact opposite of what we found with the TravelCard: We spotted no credible professional tests but tons of user feedback. Many of those who have reviewed it at Amazon say they can get at least one full recharge out of it. Moreover, unlike some mini chargers, the PowerCore+ Mini is brainy enough to sense your device's recharge rate and match it automatically, so you don't waste power. It also has a tiny LED indicator to show how much power you have left. However, unlike the TravelCard, it doesn't come with a built-in charging cable, so you'll need to carry one separately. The PowerCore+ Mini has nearly 26,500 reviews at Amazon, with a fairly solid overall rating of 4.3 stars out of 5. Along with its small size and good build capacity, owners are particularly impressed with Anker's excellent customer support. Not only does the maker back up the charger with an 18-month warranty, it makes a point of reaching out to users who report trouble with their devices. We saw several reviews from owners who say their chargers either broke down or were defective – but in nearly every case, there was a follow-up message from Anker offering to replace the device. High-capacity portable chargers are ideal for travelers who constantly use several personal electronics devices, but are not always near an outlet. These mega-chargers certainly aren't the smallest of the bunch, but they pack the power needed to charge smartphones, music players, tablets and more – even two or more at a time. 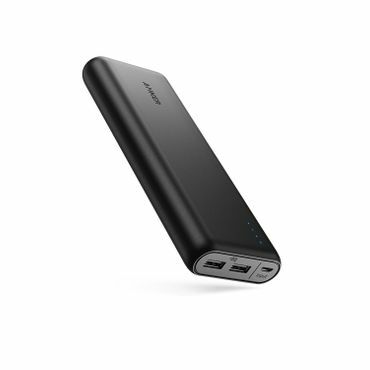 The Anker PowerCore 20100 (Est. $45) receives more positive reviews from professionals and users than any other portable charger we've seen. Wirecutter recommends this as the best high-capacity charger to stow in your luggage on a trip. Cory Gunther at GottaBeMobile also says this is his go-to charger for long trips or for charging multiple devices, capable of getting him through a whole week without an outlet. You wouldn't want to carry the PowerCore 20100 every day, as it's a sturdy block weighing 12.5 ounces and measuring 6.5 by 2.3 by 0.9 inches. However, for a long flight or a weekend in the woods away from an electrical outlet, it's just the ticket. It's rated capacity is 20,100 mAh, which is enough to provide five or six full recharges for a typical smartphone. Moreover, it has two ports, and Wirecutter found it could charge two devices at full speed – just over 2.4 A – with no difficulty. Its "PowerIQ" smart charging enables it to deliver just the right amount of charge for whatever devices are plugged into it. The Anker PowerCore 20100 receives more than 12,300 reviews from owners at Amazon.com, earning an overall rating of 4.6 stars out of 5. Owners say it charges up their devices fast, and they can get five to seven full charges out of it before it runs dry. Once it does, however, it needs 8 to 10 hours to recharge. 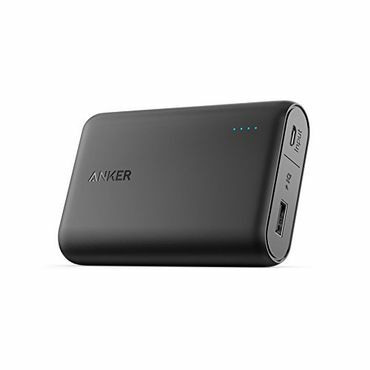 A few users complain that the power bank either broke down after a few weeks of use or didn't seem to deliver as much power as Anker claimed it would. However, most of them add that Anker's customer service is wonderful and was quick to replace any faulty devices under the 18-month warranty. If you need still more power, or more inputs, your best bet is the RAVPower Ace Series RP-PB052 (Est. $40). It's even bigger than the Anker, at 14.4 ounces and 6.5 by 2.8 by 0.9 inches. However, its capacity is also larger, at 22,000 mAh, and Gadget Viper reports that it's up to 80 percent efficient, which means it can deliver as much as 17,600 mAh in real-world use. That's enough to keep a smartphone fully charged for a week out in the woods – possibly even two. If you have multiple devices to charge, that's where the RP-PB052 really shines. It boasts three charging ports and can put out power from all of them at a combined 5.8 A. However, Tech Advisor's Black cautions that charging slows down somewhat when all three ports are in use. The power bank starts charging automatically when you plug in a device (or three) and uses smart charging to deliver the right amount of power to each of them. LED indicators on the body let you know when the power bank is running out of juice – and you should heed them, because once it's empty, it takes quite a while to recharge. Black reports that it takes 10 to 11 hours to get the charger back to full power using the micro-USB input. Fortunately, reviewers report that it's possible to use pass-through power while it's recharging, even though RAVPower doesn't advertise this feature. Simon Tunnard of Gadget Viper is impressed that the power bank "was able to charge both my boys' Fire HD Tablets faster than they could deplete them." He also notes that the RAVPower has an estimated lifespan of 500 charge cycles, or up to 20 years of regular use. RAVPower backs up this claim with a lifetime warranty. The 5,700-plus owners who have reviewed this portable charger at Amazon.com give it an overall rating of 4.3 stars out of 5. They say it's good for four to five charges, and they're impressed with its build quality and accessories (including a carrying pouch, two good USB cables, and an AC power cable for charging). Its main drawbacks are its hefty size and long recharge time. There are a few complaints about durability – but RAVPower's customer support responded to all of these with an offer to replace the power bank. Although there are lots of portable chargers on the market, there aren't as many professional reviews from highly reputable tech sites as one would expect. The best reviews we've seen are at Wirecutter and Britain's Tech Advisor, which provide detailed information based on hands-on testing. We also found some useful professional reviews at PCMag, GottaBeMobile and Gadget Viper. User reviews -- and there are thousands of them at sites like Amazon and Best Buy -- add to the picture as well, providing feedback on issues like reliability and support that expert reviewers often can't address.